How did you hear about Second Hand Saturday? Well this was the first Blog I ever followed. I don't remember how I found it but one I was going through the site and BAM there it popped up lol. thanks for the giveaway. You guys rock! I saw if on your blog one time when I was looking around and now I enter every week :)!!!! I think this was one of the first blogs I ever followed and possibly the first giveaway I ever entered. I saw it on the blog and now I see the tweet every week. Thanks for the giveaway addiction by the way! I saw it on your blog once completely by chance. I started following the blog and saw when it came up! I saw a Secondhand Saturday promo on the sidebar of someone else's blog, but I can't remember which one! I followed your blog and saw the second hand Saturday blog post. I don't really remember. I've been following and entereing for so long now. I probably heard about it through another blog. I found out about SHS after I started following you all :) Although, I have no clue how I found your all's blog in the first place! I found SHS after discovering your blog. Wich is greatness by the way. I started following your blog and saw it. I think I originally found your Parental Book Reviews and thus your blog - which I've been following for a very long time now. Love your reviews as well as the content reviews (very helpful - thanks!). I remember when I started following your blog, and on the next day you posted this! I was so exited. It was like the first giveaway i've ever participated! It was a long time ago, but I think I found your blog on the sidebar of another blog, I think it was Bitten by Books, but I may be wrong. I followed y'all on twitter and saw it! Thanks for tr giveaway! I heard about it through email notifications I get from the blog after I started following it. 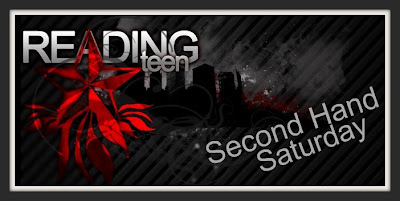 I have been following Reading Teen for a while, so I guess I stumbled on it through readership- and glad I did! Thanks! I just stumbled across it when I found your blog. Don't remember how specifically! I knew about SHS through another blog but I don't remember which... Sorry! I have been a follower for a while and get a daily email. I was just surfing around blogs, and I just randomly found it. I started following your blog!! Cannot remember, maybe a blog tour but you show up in my Google reader every time you past! I was taking a class on using the web and I needed some websites that were in my subject area/interest area so ReadingTeen fit the bill and I have been a groupie ever since! Shameful huh? Oh my gosh!!!!! You never know what those rascally ninjas will do next!!!!! I'm pretty sure it was Twitter. I found it off of Stephanie's Book Reviews on Facebook. Love this page! 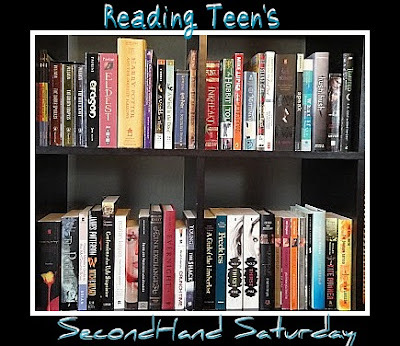 I heard about Secondhand Saturday when I began following readingteen.net. I now am a Twitter stalker. I mean fan! I think I saw the post after I started following reading teen by email. I saw it because I was already following this blog! I read about it on your website/blog. I was already a stalker/follower!! I saw a post on Twitter from Molly Quinn. I found your blog either through another book blog, or else perhaps a blog hop or tour. I've only been following book blogs for about a year. I enjoy reading about up and coming new releases. Thanks for the giveaway! And I'm an email subscriber too.. I saw this giveaway after seeing your In My Mailbox post. I saw the posting on your blog! Thanks! I saw it after I subscribed via email. I saw if after following your blog.